It is Monday, and there is nothing quite like starting the day off with a hot cup of freshly brewed coffee as you get back to the gruelling weekly torture ritual we call work. 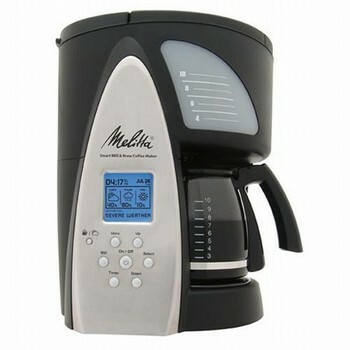 Why not use technology to your advantage by purchasing the Melitta ME1MSB Smart Brew coffee making machine? This nifty smart device does not only mix a mean cup of coffee, the Melitta Smart Brew is also capable of telling you region specific weather thanks to the LCD display, courtesy of MSN Direct. Since the information is transferred over via FM signal, there is no need for you to pull another line into the pantry just to know whether the evening weather is suitable for a round of golf. Features include a 10-cup programmable coffeemaker that is able to grind and brew coffee automatically, enabling you to attend to other more important matters at work. With 7 grind selections, adjustable strength, a brew-pause function, and a warming plate with auto shut-off, you can be assured that the Melitta Smart Brew is one mean coffee making machine – and more. The weather report is pretty comprehensive, displaying information ranging from current temperature and conditions, high and low temperatures, as well as four-day weather forecasts. Other details like visibility, sunrise/sunset times, a UV index, and national weather service warnings & alerts are available for your perusal while taking a break from your desk. You can pick one up when it ships this November 15th for the recommended retail price of $250.